Vascular surgeons at Emory Saint Joseph's Hospital, led by Joseph I. Zarge, recently performed the state's first TCAR. 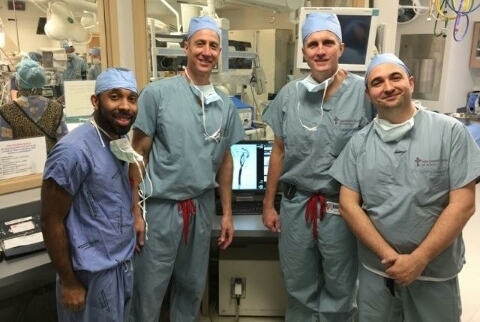 Left to Right: Bryant McIver, Emory resident; Joseph I. Zarge, ESJH vascular surgeon; William D. Jordan, Chief of Vascular Surgery Division; Nacho Leal, visiting physician from Spain. Emory Healthcare vascular surgeons are the first in Georgia, and among the first in the United States, offering a less invasive procedure to treat carotid artery disease, called transcarotid artery revascularization, or TCAR. Any repair of the carotid artery carries some risk of causing a stroke as a result of the repair itself. The most widely utilized treatment option for severe CAD involves an open surgery known as carotid endarterectomy (CEA). CEA is effective in preventing stroke during and after the procedure, but it carries some risks that TCAR was designed to help lower. Like CEA, the TCAR procedure involves direct access to the common carotid artery but through a much smaller incision above the collarbone, creating just enough room to place a sheath into the artery and deliver a stent. Using local anesthesia, the stent is implanted in the carotid artery to open and stabilize the narrowing and help protect patients from future stroke risk. Throughout the TCAR procedure, blood flow is temporarily reversed in the carotid artery to divert dangerous debris away from the brain, preventing a procedural stroke. “Being able to offer our high-risk patients a safe, less invasive treatment for carotid artery disease is a very important step forward,” says William D. Jordan, Jr., MD, professor of surgery and chief of the Division of Vascular Surgery and Endovascular Therapy, Department of Surgery, Emory University School of Medicine. The recently published ROADSTER Clinical Study evaluated the TCAR procedure in patients at high risk for complications from surgery. It demonstrated a low 1.4 percent 30-day stroke rate similar to results seen with CEA, but with a lower incidence of heart attack, nerve injury and shorter length of hospital stay. The resulting data was used to support FDA clearance of the ENROUTE Transcarotid Neuroprotection and Stent System – the interventional tools used during the TCAR procedure. In follow up to the ROADSTER study, Emory University is participating in the ROADSTER 2 trial which continues to evaluate the TCAR procedure. The prospective study includes a minimum of 600 patients at up to 100 sites across the nation. “We are helping further evaluate this important innovation and are hopeful our participation in the ROADSTER 2 study will build upon the existing clinical evidence to help positively impact stroke prevention efforts in the U.S. and around the world,” says site principal investigator Ravi Veeraswamy, MD, associate professor of surgery, Emory University School of Medicine. Emory Healthcare is currently offering the TCAR procedure to patients at high-risk for traditional CEA. The first TCAR at Emory was performed at Emory Saint Joseph’s Hospital on February 9 by Joseph I. Zarge, MD, assistant professor of surgery, Emory University School of Medicine and his colleagues.